Loosely translated, a museum of hunting and hunting art. Get a sharp stick and chase something down and hope it doesn’t kill you before you kill it. Better yet, get a dog to do the chasing, and if it is a big dog, maybe it can dispatch the prey at the same time, saving the hunter the aggravation of being mauled and ending up on the wrong end of the food chain. So somewhere between the time of the caveman and the invention of agriculture, hunting with dogs became the best way to stay fed and stay alive. Documenting this symbiotic relationship with dogs in art is a mark of civilization. This museum is a testament about this relationship as much as is about hunting. 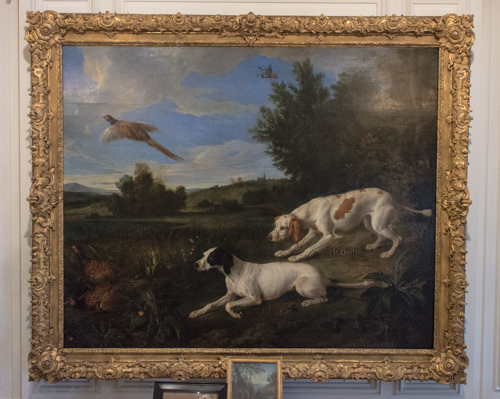 The galleries are filled with hundreds of world-class paintings and sculptures depicting our appreciation for canine hunting partners. 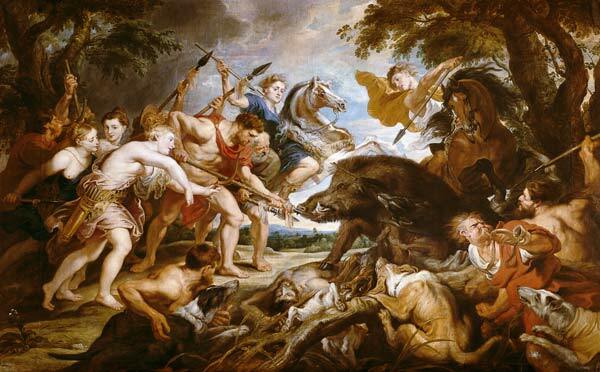 This first painting is an example of hunting boar with a sharp stick, at the expense of the dogs and one hunter. Big dogs, bigger boar. For those of you who are classical scholars, you may recognize this as the Calydonian Boar of Greek mythology. 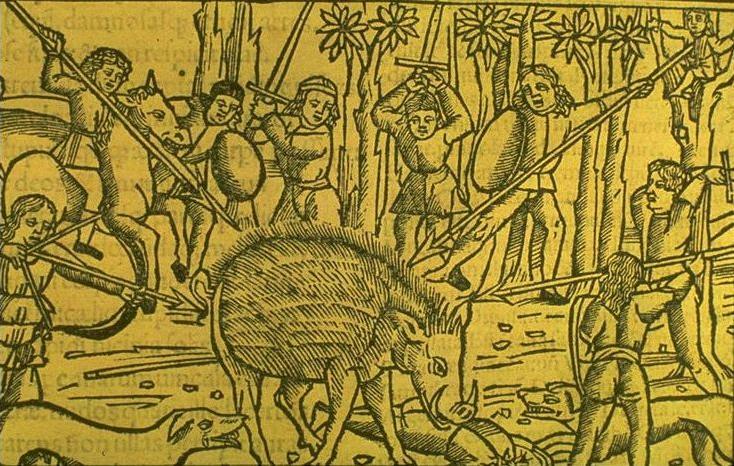 Here is another woodcut from the 16th century, also depicting the Calydonian Boar being hunted with dogs and sharp sticks. If you had the financial resources to outfit your pack, you could have special dog armour woven out of horse hair, a precursor to bullet-proof vests. Light enough to wear, flexible enough to run and hunt in. 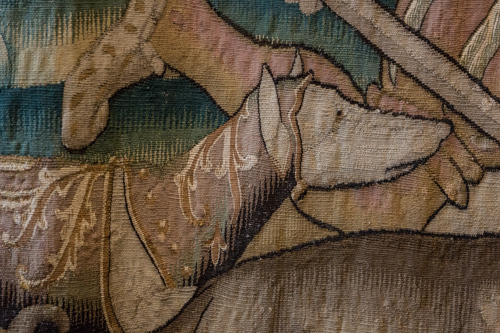 This detail from a vintage tapestry shows a hound with both head and neck protection, plus a bit of body armour. 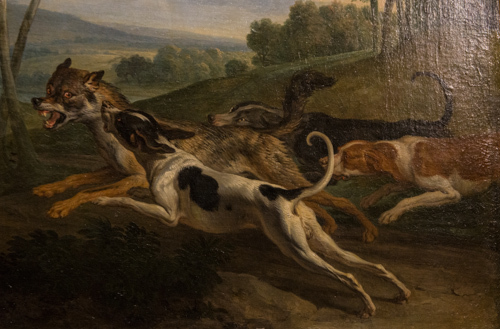 Notice the section of the hunter running behind the dog with a sharp stick. 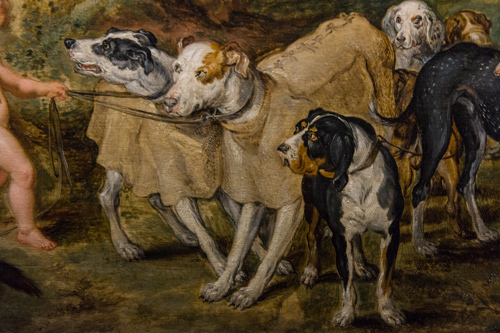 In 1620, Isabelle of Habsburg, regent of the Netherlands, commissioned a couple of local painters to glorify her pack of hunting dogs. 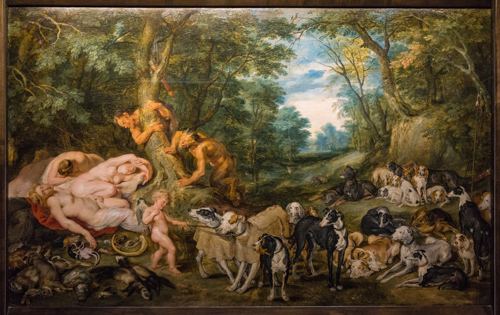 Peter Paul Reubens and Jan Brueghel worked up this nice painting of Isabelle’s pups with the goddess Diana thrown in for some art history credibility. Check out the little naked dog handler with wings. He has a couple of hounds on leashes with the latest in horse-hair technology, hopefully keeping them boar-proof. Hunting wolves was not without its challenges, too. Usually, if you had more dogs than wolves, then you could win with numbers. Wolves, like dogs, prefer to go for the throat. Rather than encumber your pack with body armour as in hunting boar or stags, one only needed to protect the neck of your favorite wolf-hunting dog. 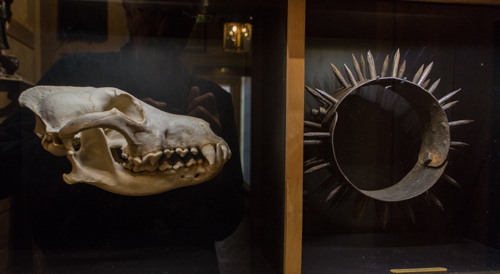 In this display case, we found a great skull of a wolf and the corresponding collar for the hunting dog. No other explanation is required. But not all hunting was for dangerous game. It was discovered that the wily pheasant or partridge could be brought to the table with the aid of a flushing dog. Once people had reasonable firearms loaded with gravel or shot, a whole new sport evolved. (The existence of such sport is the excuse to post this to the blog.) Of course, having such resources usually was the province of upper class. 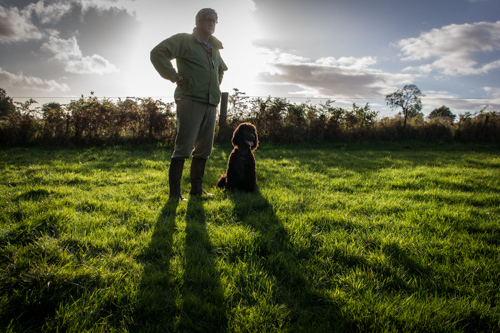 Adding in a nice pack of dedicated spaniels, game keepers, and shooters led to the sport of kings. 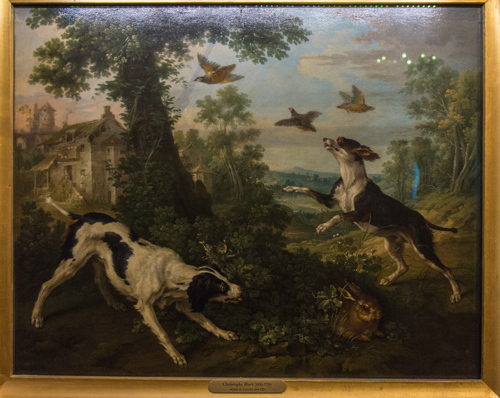 While the artist Christophe Huet thought that the picture below might just have made a nice composition with a dramatic action sequence, what he was actually recording was a dog that was not steady to the flush. 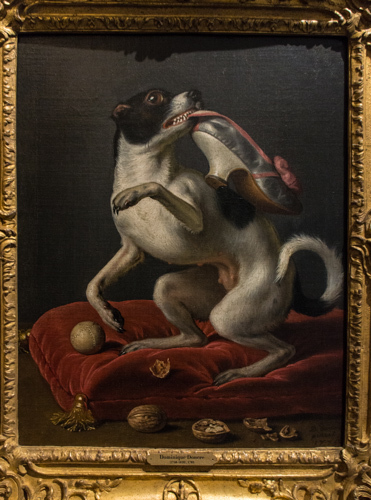 This image set dog training back by a couple of hundred years. And speaking of documenting poor dog training, check out this bad girl. The Musée de la Chasse et de la Nature is loaded with remarkable art, taxidermy, weapons (pointed sticks to shotguns), hunting horns, duck calls, and artifacts that all relate to hunting, albeit from a wealthy European’s perspective. But that’s not all. 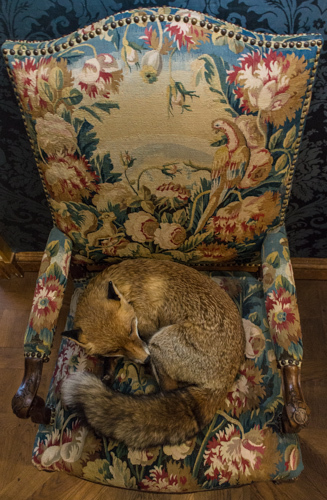 Sitting quietly in an upholstered chair off in the corner on one of galleries was this snoozing fox. Everyone could use a dead fox on their furniture. Notice that there is no cat hair on this chair and the upholstery is still in great shape. And not all exhibits were dog oriented. 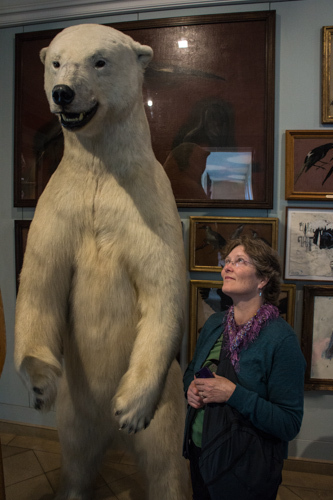 Here is Patrice, checking out another hunting artifact, free-standing in a gallery of bird art. Paris is mostly about good food, wine, and art. 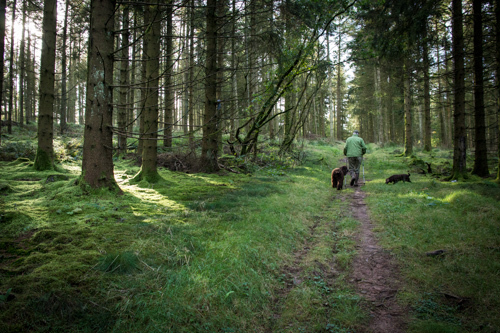 Even so, we did manage to find this one dog-oriented activity to make our vacation well-rounded and balanced. 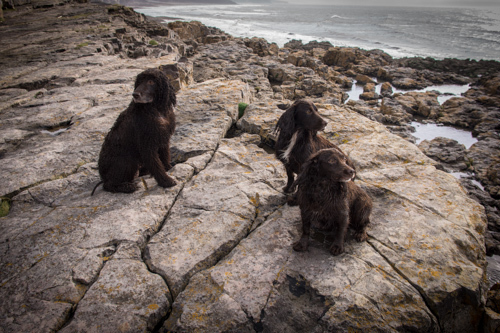 First, I want to congratulate the 6 Irish Water Spaniels who have been invited to pre-enter the prestigious Westminster Kennel Club show in 2013. As in the past, for 2013, the top dogs in each breed in breed point standings are invited to pre-enter. I’ve met several of these dogs, and they are lovely, beautiful dogs who present very well. I don’t know what you notice first, but the first thing I notice is that all 5 dogs have titles on both ends of their names. What this means is that not only do they have show championships (CH) or grand championships (GCH), they also have titles on the right sides of their names. The list of American Kennel Club titles on the right side of a dog’s name recognizes achievements in “performance” events — things like obedience, rally obedience, tracking, hunting tests, agility, and other events in which the dog works with his person to do some kind of work. In other words (and being extremely simplistic about it), they have brains in addition to all that beauty. But take another look at that list of WPGs. Notice that every single one has a hunting test title: 3 Junior Hunters (JH), 1 Senior Hunter (SH), and 1 Master Hunter (MH). 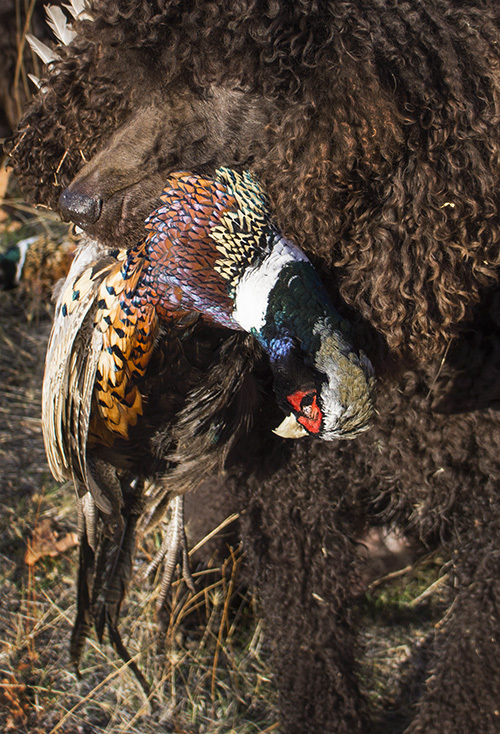 Sporting dogs, like IWS, WPGs, and others, were bred to hunt: to help the hunter bring game home to the table. These hunt test titles show that the aptitude and ability is still there in those dogs, whether they actually hunt for birds for the table or they do it in the hunting simulations that are hunting tests. Many breeders of sporting dogs do their utmost to ensure that their breeds are not divided into “show” lines and “working” lines, and it looks like these WPG breeders have succeeded. Many IWS breeders do the same, which is why you’ll find a high percentage of IWS with titles on both ends of their names. For just one example, go to the RealtaIWS website’s Achievements page, to see the list of IWS bred by Rosemary Sexton (Cooper’s breeder) who can show off their their beauty and structure in the show ring, as well as do the work in performance events. Tonight’s project — dog soup. I was inspired by our recent trip to Wales, where we stayed with our friend Martyn. 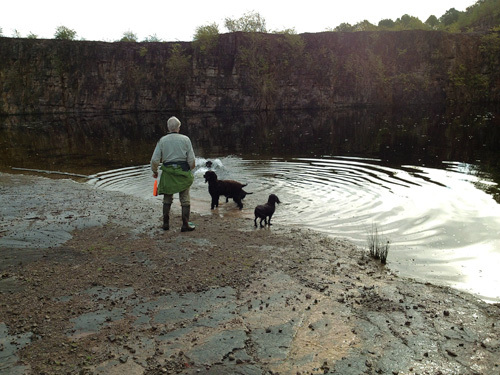 He’s a long-time Irish Water Spaniel breeder and handler. He’s also a big believer in natural foods for dogs and people. He makes what he calls “dog soup.” No, it’s not made out of dogs. It’s made for dogs, out of a variety of vegetables, seeds, and a little fruit. He uses it as a kind of topping over the rest of the dog food, and it’s clear his dogs love the food he gives them. I watched him make dog soup once while I was there, and it seemed to be a collection of mostly green, mostly non-cruciferous vegetables, leafy greens, various summer and winter squashes, some seeds (ground before blending), a little apple, a little raw garlic, and enough water to blend. So tonight I was inspired, finally, after all these weeks being home from our visit to Wales. Cooper’s coat is not beautifully thick and glossy, and I’ve been thinking about improving his food to see if that helps. (Tooey’s coat is beautiful, just like the rest of her. I think she could thrive on anything.) But with his compromised immune system, Cooper has a bunch of food restrictions, like no raw meat unless it’s been flash frozen immediately and no grains. Dog soup seemed like something that might help and can’t hurt. I didn’t have on hand all the lovely vegetables that Martyn uses, but I did have some vegetable cooking water, a little meat broth, a bunch of cooked green beans, some raw spinach, and a little raw garlic. I blended it up, poured it on Cooper and Tooey’s food, put the bowls down for them, and stood back. They both devoured it. Bowls licked clean. Hmmm… That wasn’t so hard. Maybe I can keep doing it. It seems that in early November, close to election day, all things come together that allows us to go pheasant hunting. This year is no different. 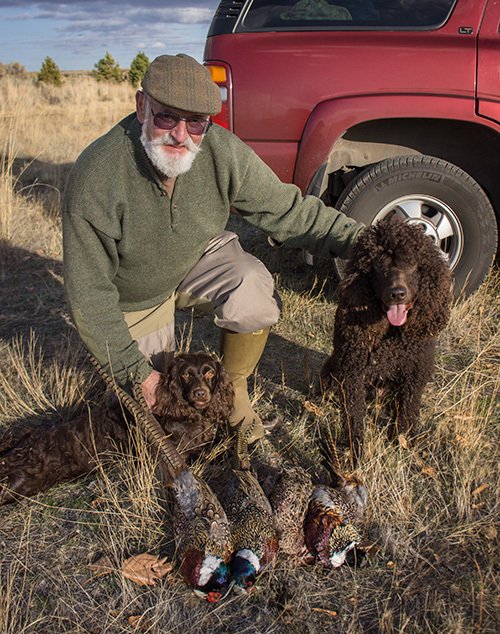 Cooper, his hunting buddy Scarlett (a Boykin Spaniel), Norm, and I spent the day in central Oregon for the first bird hunt of the season. We started with Cooper, who flushed up a few birds. He got too far ahead in a couple of cases, so the birds flushed up had no fear of being shot by either Norm or myself. But Norm did drop one bird that Cooper flushed. After that, it was time to give Cooper a rest and hunt behind Scarlett. We started where one of Cooper’s flushed birds had landed, and in no time Scarlett put up a chukar, which Norm brought down with a nice retrieve by Scarlett. Scarlett flushed three more pheasants, which we successfully shot and made available for dog delivery. Then it was time for Cooper to retrace Scarlett’s steps and see if she missed anything. One more pheasant came up on Cooper’s flush, but this time after I shot it, the bird fell into a stand of tall cattails in a marshy area about 50 yards away. I looked at Cooper who was just sitting there staring at me (steady to shot?). I gave him a release and off he disappeared into the cattails. I was prepared to handle him to the area of the fall, but since he had completely disappeared, there was no point as we couldn’t see each other. Just as I was thinking about putting down the gun and wading in to where I had seen the bird fall, Cooper stepped out of the cover with the bird in his mouth. It doesn’t get much better than that. Today’s bird count: 5 pheasants and 1 chukar. For the record, Cooper and Scarlett traveled inside the car and not on top. While in Wales, we had a number of amazing and fun adventures: Caerphilly Castle, the Welsh Life museum, a tour and tasting at the Penderyn Distillery, the dog show, the field trial, a Joshua Bell and St. Martin in the Fields concert at St. David’s Hall in Cardiff, and sitting around the dinner table eating Sandie’s wonderful cooking and talking with our friends. But I think of all of them, my favorite were the daily walks. 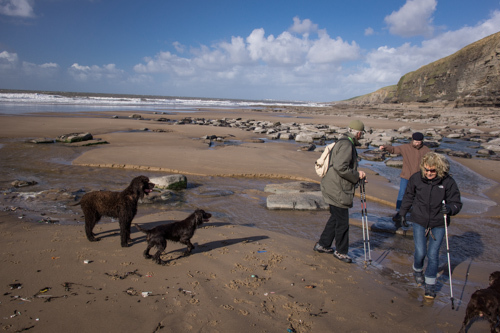 Martyn has the very good fortune to live within 10 minutes of a wide variety of terrain where he can walk his dogs. 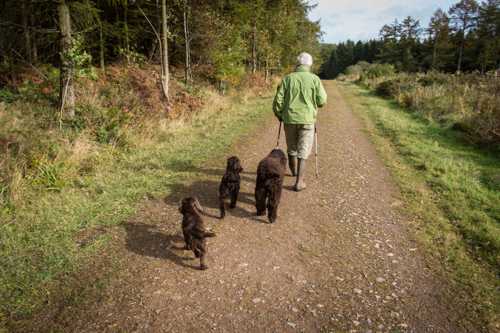 Plus, he lives in dog heaven — rural land veined with foot paths, public right-of-ways that have existed for centuries, allowing the public access through private farms, pastures, woodlands, and even a quarry. Sometimes walkers have to crawl over fences and through gates, but the right of access still exists. 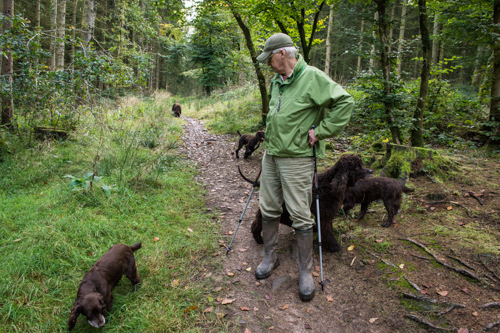 Martyn makes sure his 5 dogs go for a long walk twice a day. And while Russ and I were there, one or both of us went along each time. 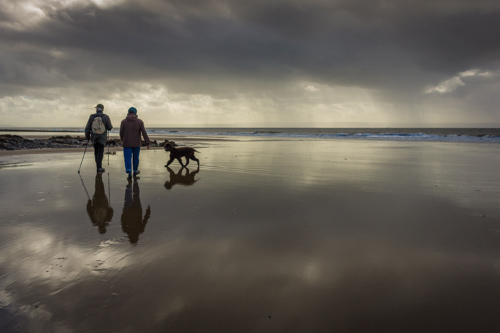 One day, Martyn and Sandie, plus three dogs, went to two beaches, which were about 45 minutes away, and well worth it (even during the fierce 10-minute downpour). 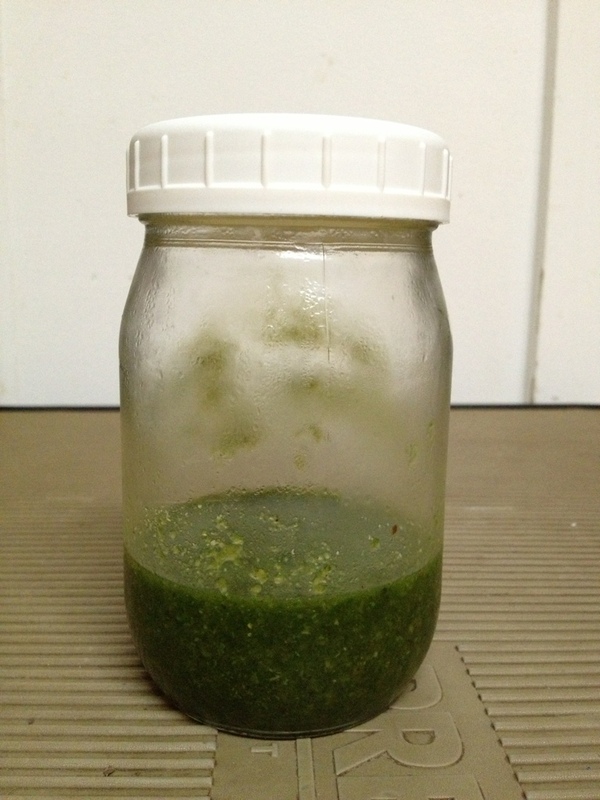 Here is my recipe for an ear cleaner that keeps my long-eared IWS ears clean and smelling sweet. I use it after they’ve gone swimming and whenever their ears start to smell a bit off. It’s not to be used to treat medical conditions or infections, though. For that you need to go to your veterinarian. The recipe is not original with me. I’ve found many variations on the web, particularly on the websites or Internet forums dedicated to spaniels and other long-eared dogs. If you object to a bit of wet mess or the smell of vinegar in the house, you might want to use this wash outside or in your dog’s bathtub. Shake before each use to make sure the boric acid is dissolved. Hold the ear flap up so the ear canal is tilted up. Fill the ear canal with the ear wash just until it runs out. Gently massage the base of the dog’s ear — you should hear a squish-squish sound. Use a towel to catch any wash that runs out and then let the dog shake his head. Gently wipe off the inside of the ear flap. Repeat with the other ear. I have seen other recipes that use Gentian Violet or Betadine. I don’t use those ingredients because they stain. *I’ve seen recipes with rubbing alcohol, but I don’t use it because it can sting if the dog has any abrasions in their ears.